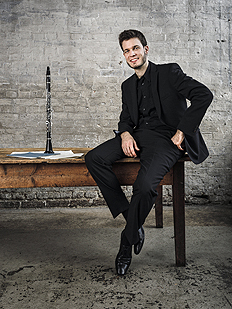 A “velvety soft tone and sensitive interpretation” is how the Press has described the playing of clarinetist Christoph Schneider, born in Frankfurt am Main in 1989. After an early study program with Johannes Gmeinder in Mainz, his training brought him to Martin Spangenberg in Weimar and later to Ralph Manno in Cologne. He was supported by scholarships from both the German National Academic Foundation and Villa Musica Foundation. He has also drawn inspiration from his musical collaboration with such personalities as Kirill Petrenko, Klaus Thunemann, Sebastian Weigle, and Ingo Goritzki. He has also earned acclaim as a soloist at numerous competitions, and was not only honored as the best clarinetist at the 2017 Aeolus International Competition for Wind Instruments, but also won the special award for best interpretation of a contemporary work for his composition Konstrukt I. He has performed as a solo clarinetist with such major ensembles as the Deutsche Oper Berlin orchestra, Frankfurt Opera House and Museum Orchestra, Gürzenich Orchestra Cologne, and Beethoven Orchester Bonn. Since 2016 he has served as First Solo Clarinetist of the Deutsche Oper am Rhein Duisburg and has taught clarinet at the Cologne University of Music and Dance since 2018. Christoph Schneider gives frequent concerts with pianist Yuliya Balabicheva, and numerous radio recordings with Deutschlandfunk, WDR, and SWR offer testimonials of his artistry.